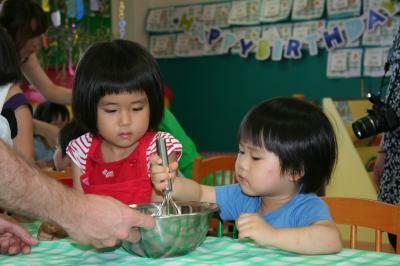 Today our teacher taught us the “On Top of Spaghetti” song and we made “Spaghetti”at art time. 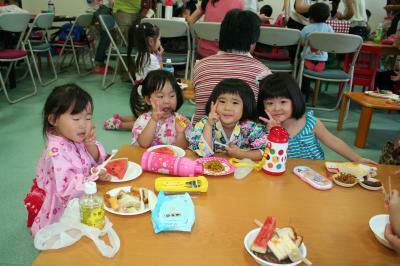 Our Summer 2013 Tanabata Party was great! 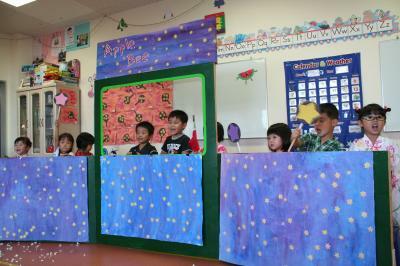 First we put on a great song and puppet show performance for our families to enjoy. Then we took turns trying to break open our pinatas. It was hard, but we got a lot of candy! Afterwards we had a pot luck party with many delicious foods our mommies and daddies had made. When we finished eating everyone worked together cleaning up our school. 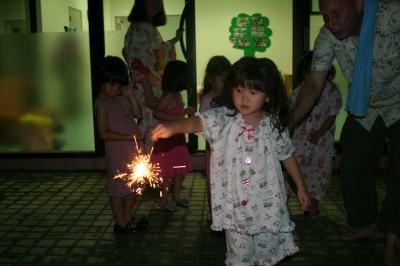 Then our older students said, “good-bye” to their parents and stayed at school for a fun pajama party! We lit up fireworks and stayed up late talking. 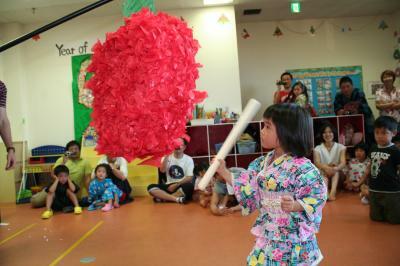 This year’s Summer Tanabata party was one of the greatest yet. We can’t wait to do it again next year! 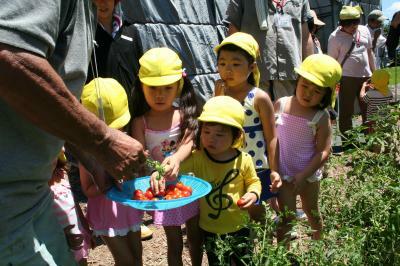 Please enjoy your Summer, too! Today we did a final rehearsal for our summer party. 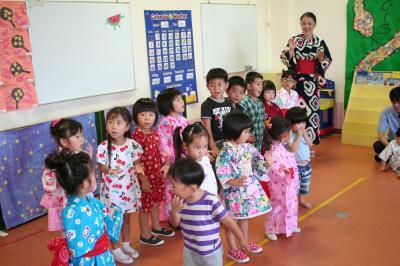 Today we practiced our summer party Tanabata puppet show. Timing each puppet’s appearance is difficult, but we are doing our best. 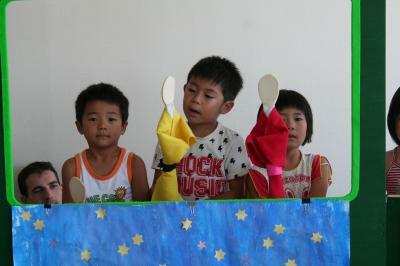 We hope our parents enjoy our puppet show! Our 2013 Apple Bee Summer Party is this Sunday. We’ve been practicing hard for months and can’t wait to show our mommies and daddies what we can do. Today we went back to Alutana school. 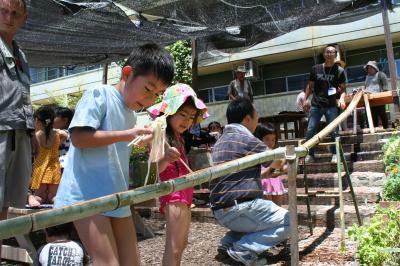 We picked cherry tomatoes, played in their home made pool, and caught somen noodles off of a bamboo slide. It was another great day with our friends at Alutana. Thank you! We can’t wait for our next visit. 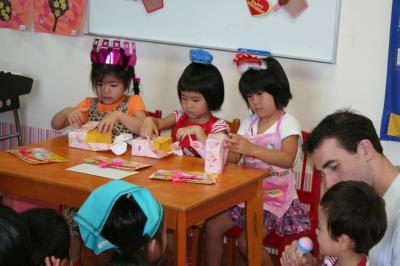 Today we had a birthday party for our friends who were born in July. We sang songs, looked at their babypictures, and cooked pancakes with their mommies. After today’s water play we studied with our workbooks. Rainy season in Kumamoto is over. 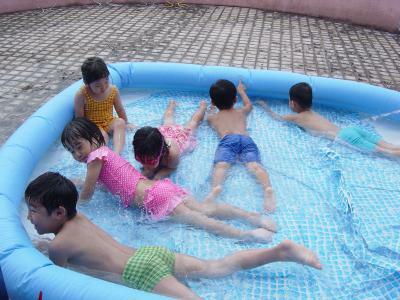 Today was very hot so we cooled off in the pool. It’s fun playing with water in the summer! We love the water! Today our teacher played a touch the card game with us. 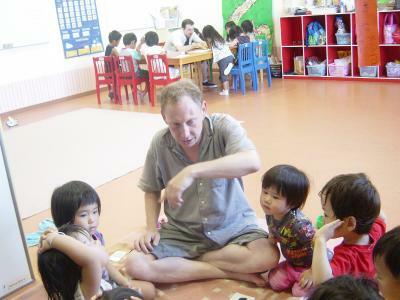 Games are fun and help us remember what we have learned. 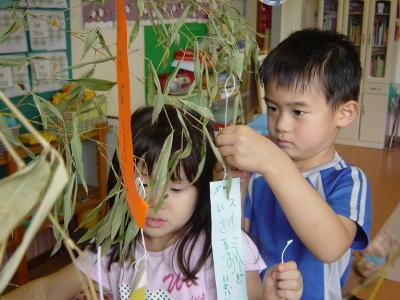 Today we wrote our wishes on colorful paper and hung them on our beautiful Tanabata tree. We have practice writing everyday. Today we practiced by writing this month’s vocabulary in our notebooksusing words and sentances.Our English skills are improving everyday! 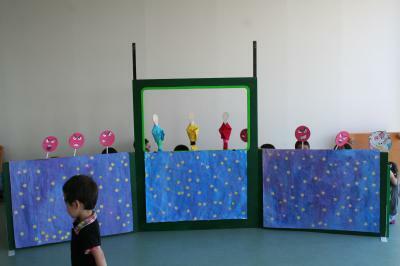 Today we made the Milky Way for our puppet show at the summer party. It is a beautiful Milky Way! July is here and It’s HOT! 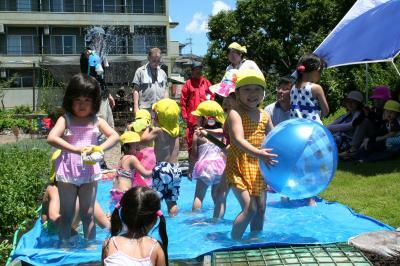 Beginning this month we will enjoy water play time. Today we practiced changing our clothes and drying ourselves off, too. 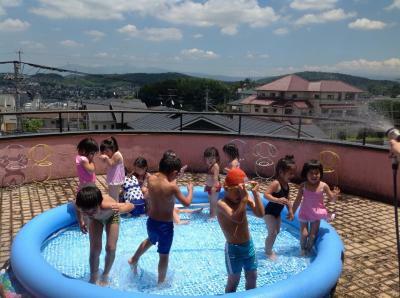 Playing in the pool is great way to keep cool!